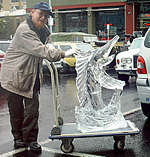 Australian born Glenn Smith has been a Ice sculpting professionally since 1983. He was the first Westerner to study with The Japanese Master Ice Carver, Hideo Hasegawa. 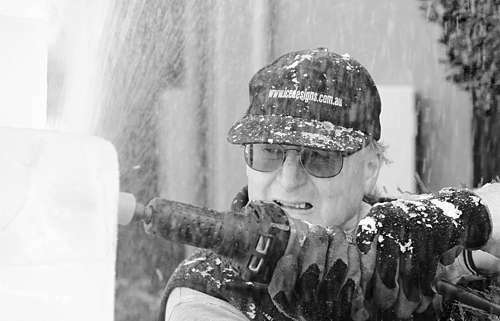 Glenn has represented Australia in international Ice Sculpting Competitions including Canada, Japan (9 times), Norway, New Zealand, Belgium and China and has judged international contests in Germany and Canada. He has received many major Ice Sculpting Commissions including the 1987 Americas Cup Ball, the opening of Canberra's Parliament House, Visyboard Christmas events from 1987, Lindsay Fox's 70th Birthday Party in Sydney, "Frozen in Time" Installations, Sovereign Hill, Ballarat (see Media Section), United Nations 50th Anniversary Celebrations, Crossroad of Nations, Australian Feature, Ottawa 1991, Australia's Centenary of Federations Exhibit at "Winterlude 2001 (see Winterlude in International section), IceWorld, Lubeck 2004, Germany. The Quality of ice is important to us. Being based on the Bellarine Peninsula, we capture the rain water as storms roll in from Bass Strait. We use 100% harvested rainwater and power our Ice Making Machinery with a 1.75kw solar panel array which provides 50% of our power needs. The ice makers are regularly checked throughout the 3-4 day ice making process to give us the clearest ice. The clearer the ice, the longer it lasts! Having a wealth of international experience and by keeping up to date with the latest developments, we tailor individual requests to suit your needs. All sculptures, regardless of their dimension, are individually carved. The size of sculptures range anywhere from small, individual table top pieces, to a grand scale depending on your budget. Sculpting is performed in our workshop and delivered at -10°C in a freezer van or sculpted onsite as a live performance. Sculpting tools include specialised Japanese ice sculpting chisels and saws. chainsaws, and specialist cutting blades attached to drills and die grinders. We don't do molds! A very simple fact, but there is a lot of confusion out there. Molds are made in the same way as concrete garden gnomes, you pour the water into a mold and it freezes! The cheaper molded ice comes out white, because it is full of air, causing it melt much faster than clear ice. Modern techniques allow some molds to get close to clear results, but because the ice is frozen into a rubber sleeve, it does not allow for much depth in the detailing. This causes the details or the ice to melt quicker than carved ice. Down Under Ice Designs has Comprehensive Public Liability Insurance. Quotations for multi-block designs and live performances can be arranged with client consultation.